Harvest Moon has been appointed as stockists of Artistic Upholstery - the finest English bespoke upholstery furniture since 1952. Each individual piece is entirely handmade to order in Long Eaton the home of English furniture craftsmanship. Founded over half a century ago by Jim Mitchell today Artistic Upholstery is still a family owned company. Artistic Upholstery was awarded the Production Guild Mark by the Worshipful Company of Furniture Makers in 1998 as a mark of recognition of their high quality of production and manufacture. The Artistic Upholstery furniture range is entirely bespoke and includes the best of modern and traditional bespoke English furniture - all of the sofas, armchairs, occasional chairs, sofabeds, daybeds, chaises, office and desk chairs, ottomans and footstools are handstitched including any valances and bullion fringes. Artistic Upholstery bespoke furniture is available in any of the traditional or modern upholstery fillings and finishes and most pieces are available in a range of leather hides as well as fabric. Sizes can of course also be altered to meet your requirements. Of course any of the bespoke sofas, bespoke chairs and other furniture pieces can also be made in the customer's own materials. Extra options include fabulous bespoke bullion fringes colour coordinated to your requirements. At Harvest Moon we can supply all of the Artistic Upholstery bespoke furniture pieces, including the Chesterfield sofa, as shown above. Click here to go direct to the Artistic Upholstery Furniture website for the full section of furniture available. Simply choose what you want from their website and ask us for a price. To totally appreciate the unique quality of their bespoke furniture please contact us for an initial chat about your requirements. We are happy to advise if you are not sure what furniture you want, call or come and see us at our furniture showrooms in Southport. We'd love to see you and if desired we can also arrange an appointment to view and visit the Artistic Upholstery workshops and showroom. 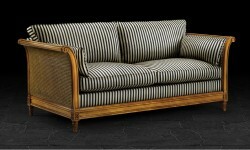 We offer a FREE 2 man delivery service to UK mainland addresses on all Artistic Upholstery furniture orders! Finest English bespoke upholstery handmade to order including bespoke sofas, armchairs, sofabeds, day beds, chaises, occasional chairs, dining chairs, office chairs, ottomans and footstools all handstitched including any valances and bullion fringes. 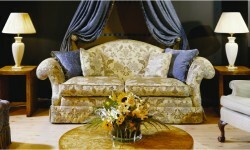 Artistic Upholstery bespoke furniture is available in any of the traditional or modern upholstery fillings and finishes. Most pieces also available in a range of leather as well as fabric options. Artistic Upholstery pieces can also be made up in the customer's own materials and bespoke sizing is also available. 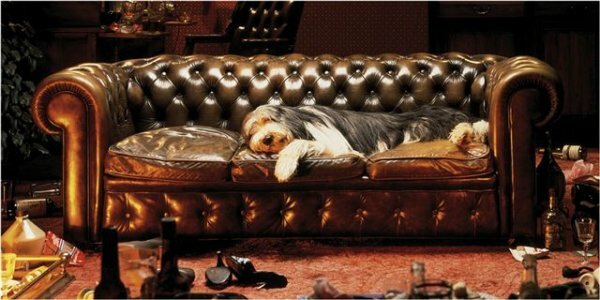 Click on the image or link above to find out more about Artistic Upholstery bespoke sofas and chairs. Here you'll find Artistic Upholstery's collection of decorative sofas, armchairs, occasional chairs, chaises and footstools with more decorative features than their standard collection. You can also see examples of special commissions handcrafted by Artistic Upholstery to individual customer's own designs including frame shapes, size and fabric. Let your imagination run wild and design your own classic, contemporary or retro upholstered furniture from scratch! Click on the image or link above to find out more about Artistic Upholstery decorative sofas and chairs and special commissions.